There are many factors that play a role in creating quality embroidered apparel. A design is first custom digitized. Digitizing is taking a logo and turning into a stitch format for our top-quality Tajima machines to read. It’s not as simple as just loading an image in and clicking a button. Our Digitizer re-draw the logos from scratch. They take into consideration there are different settings for different fabrics. There are also different types of stitches as well that work for different sized logo elements. A satin stitch is the most common stitch type, but over large areas, the stitch type is often a pattern fill. Then there’s also a run stitch which is used for very small details.The density, stitch length, underlay, and stitch type changes on different types of fabrics for each digitized file. Once the digitized logo is created we do a sew-out sample of the logo, on the specific fabric it was digitized for. The density of the thread can be adjusted if switching from a heavy work shirt to a lightweight dri-fit shirt, but a left chest polo file can’t be used as a front of a hat. The sew out sequence is different, and the properties will be different as well. For hats, the sew-out sequence starts in the middle of the design and pushes outward sewing out one side and then starts in the center again to sew-out the other side. The thread type (rayon or polyester), backing, and needle size will be adjusted before being put on the machine. All garments will be hooped in the designated hoop with a backing for that type of fabric. The machine speed also must be adjusted as well depending upon the size of the logo. Designs with small text have to run slower than designs with large pattern fills. All these factors can affect how the digitizing will sew out on the machine. The backing is a material used to stabilize the garment once placed inside the hoop when running on the machine. Hats get a Tear-Away backing placed on the back before being put on the machine and most polos get a Cut-Away or even a Mesh backing depending upon the material of the garment. Sometimes a water-soluble topping is placed on top of the garment to make sure smaller text doesn’t sink into the intricate deeper weave of certain fabrics. This water-soluble topping is removed with water once the garment is being trimmed. Once the design has finished on the machine it is taken out of the hoop. All embroidery is trimmed for any large jump stitches. The backing is also trimmed in the back or if it’s Tear-Away, we tear it out. Then the water-soluble topping is removed with water and each garment is steamed to remove the circle from the hoop, which completely disappears. Why Safari Sun for Embroidery? We are the premier Orlando experts in high quality, affordable embroidery for businesses, medical offices, non-profits, schools and sports teams. Our team of embroidery experts have not only the knowledge of just how to run the machines and hoop the garments but also how to digitize a logo. The digitizing plays a large role in quality of your embroidery. It is one of the most important factors in the embroidery process, but this dictates how your embroidery will look. With our years of experience, we know what to look for in quality embroidery and how to trouble shoot if any issues were to arise when doing preliminary sew outs. Along with Corporate embroidery, we also embroider Tackle Twill (applique) such as Sports Jerseys Numbers and names. We also specialize in the embroidery of leather and vinyl. We stay up to date on trends and know all the tricks to Puff embroidery for hats. When you want it done right, give us a call. For a typical left chest embroidery, the ideal design has a maximum dimension of 3.5″ – 4.0″ wide. There are exceptions when a design has one dimension that is several times larger than the other. The size of many designs are dictated by the smallest text in the design. We will size your design appropriately based on our experience. 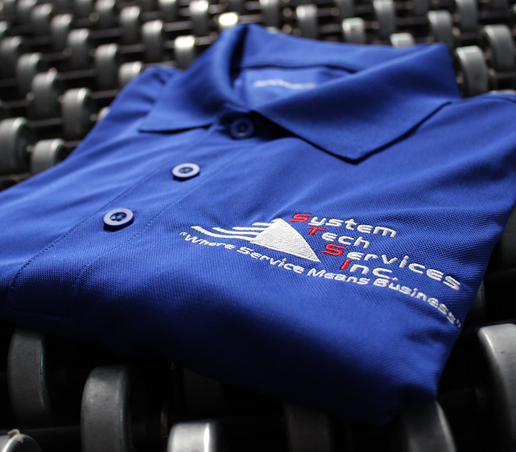 The smallest text we can embroider with real accuracy is about 0.25 inch high. We can make adjustments to your design to compensate for slight variations. Typically, a single line of text can only include about 20 characters and spaces before it requires the text to be split into two lines. The maximum height for a headwear design is 2.50 inch high. On visors, the maximum height is 1 inch tall. The width may be as wide as 5″ or even more. 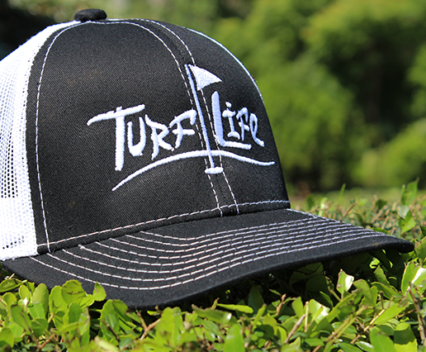 Embroidery on the back of a cap may be included for an additional cost. This is a great location for a Web address or to personalize the cap with a team members name.